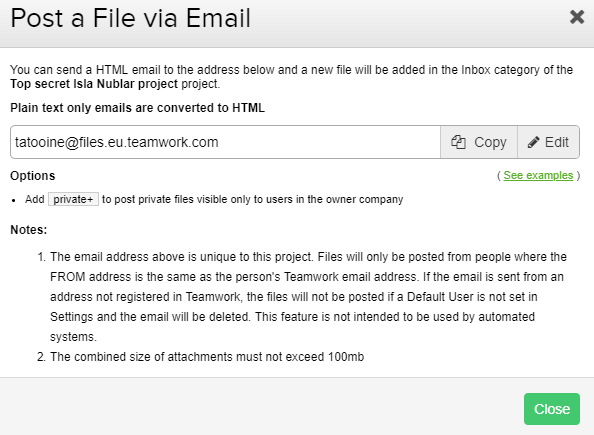 Within Teamwork Projects, you can add files directly to your project via email. Each project has a unique email address that allows you to upload files by sending an email with the files attached to that projects email address. Note: You will have to attach the files to the email for the upload to work. Inserting into the body of the email will not work. To locate your projects email address, go to the files area of your project. Select the options button (three dots) to the top right, and choose Post a File via Email. You will now have the option to copy the email address from the pop up modal. You can also choose the edit option which will allow you to enter a custom beginning to the email. You can use this address to send a HTML marked-up email without any attachments, this will be saved and added as a new file to your project. There is a combined upload limit of 100MB per email. Note: Do not use the file-by-email address to post files from automated systems that could generate hundreds of files. Abuse of this feature will result in suspension of the feature from your account.